What is the Ken & Lenka Morgan Scholarship? The Ken & Lenka Morgan Scholarship is a one-off scholarship valued at $5,000 that can be awarded to one young person each year. Applications for the 2019 academic year are now closed. Applications will open online in August 2019 for the 2020 academic year – The 2019 recipient of the Ken & Lenka Morgan Scholarship will be announced on 21 November 2018. The scholarship recipient should have clear educational, employment and/or personal aspirations, the ability to identify potential avenues for reaching their goals, and the drive and determination to reach these goals. The scholarship recipient should have the ability to achieve in their chosen education, employment, and personal pathways. The scholarship recipient must be able to identify the benefits the Kids Under Cover studio and scholarship/s have provided for them and / or family / household. Bruno will be moving from Forrest, 2 hours outside Melbourne into Melbourne to attend University and study nanotechnology. His goal is to become a Bio-Medical Nano-Technician so he can assist in finding ways to discover and treat cancer growths in patients and help others as he has been helped. Bruno’s physics teacher inspires him because he has helped a lot of people with his work on diseases when he was a scientist at the C.S.I.R.O, before he became a teacher. How many Ken & Lenka Scholarships are on offer? There is only one scholarship available per year. I have never received a Kids Under Cover Scholarship previously. Can I apply for the Ken & Lenka Morgan Scholarship? No. You can only apply for the Ken & Lenka Morgan Scholarship if you have received a Kids Under Cover Scholarship in the same year. 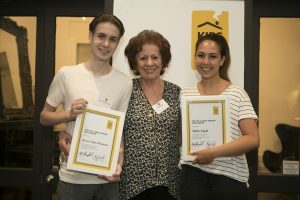 I have not received a Kids Under Cover Scholarship for the 2016 year but have received a scholarship previously; can I still apply for the Ken & Lenka Morgan Scholarship? No. You can only submit an application if you received a scholarship for the 2016 year. I was awarded the Ken & Lenka Morgan Scholarship in a previous year, can I re-apply in another year? No. The scholarship is a one-off and cannot be awarded to the same person more than once. If I apply and my application is not successful, can I apply for this scholarship again in future years? Yes, as long as you are a Kids Under Cover Scholarship recipient of that year you can submit an application for the Ken & Lenka Morgan Scholarship each year. I used to live in a Kids Under Cover Studio, but no longer do. Can I still apply for the scholarship? No. Only young people who are currently living in a Kids Under Cover Studio, or young people who are currently living in the main house where the studio is located, are able to apply. However, exceptions may be made if the young person is residing elsewhere temporarily as a direct result of their study / training course (i.e. living in student accommodation). I don’t live in a Kids Under Cover Studio, am I eligible for a Kids Under Cover Scholarship? Yes. If you live in the main house where a Kids Under Cover Studio is located. Can I apply for a Kids Under Cover Scholarship next year if I receive the Ken & Lenka Scholarship in 2017? Yes, you are still eligible for a Kids Under Cover Scholarship in 2017.